There was a little news out today about our first storms of the year with the “Earliest Return of Winter Conditions to Lake Tahoe since 1969“. I guess that means we can all look forward to another great year of skiing, boarding and snow play. As far as Danville real estate has performed this year versus last the word “steady” comes to mind. Through September the same number of single family homes have transferred in 2011 versus 2010. Median prices are down a little more than two and a half percent while marketing times are almost identical. Attached homes have not performed as well with declines in units sold and pricing as well as an increase in marketing times. 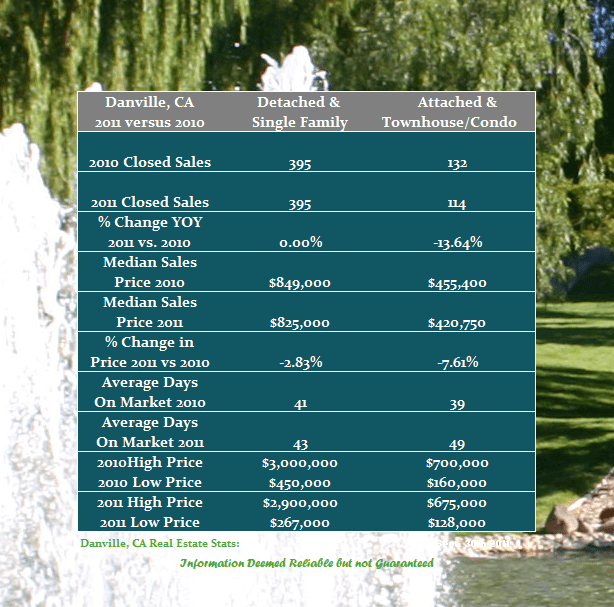 Considering buying or selling in Danville? Give me a call. Share the post "Year over Year Real Estate Performance in Danville"